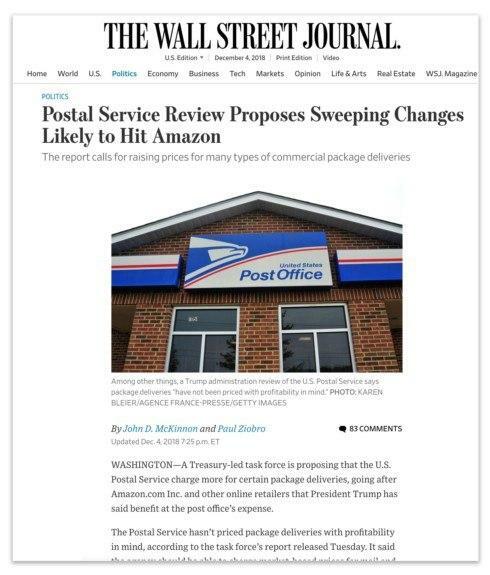 Good news for small retailers: Amazon will pay 9% - 12% more to ship packages in 2019--and a new commission's report suggests it pay even more, reports today's WSJ. The Postal Service faces significant financial challenges. It has been losing money for more than a decade and is on an unsustainable path, the report says. The USPS is forecast to lose tens of billions of dollars over the next decade and currently has $89 billion in liabilities versus $27 billion in assets, for a net deficit of $62 billion.